Enjoy cheaper commutes with Grab! From 15 - 22 August 2017, you have been selected to enjoy RM6 off x 10 or RM8 off x 8 Grab rides from 10AM - 10PM. Just key in the Grab promo code GRAB60 or GRAB64 to enjoy discounted rides. Limited to 5,000 redemption per day. 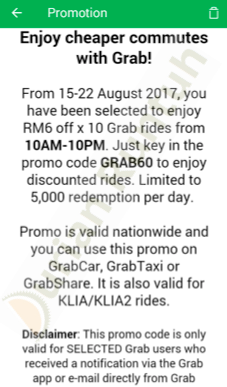 Disclaimer: These Grab promo codes are only valid for SELECTED Grab users who received a notification via the Grab app or e-mail directly from Grab.